« Price information of Bs.As. 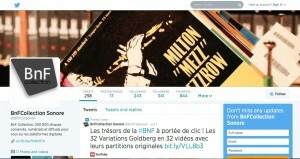 While I was looking for music on itune store, I came across this amazing music collection – BNF, Bibliotheque Nationale de France (http://www.bnf.fr/fr/acc/x.accueil.html). This French national library music collection on itune store covers many kinds of music: classical, jazz, world, pop, French songs, children etc. The whole collection of course is mainly French, but the world music selection is just awesome, Middle East, South America, European, Caribbean islands & Asia, you get a bit of everything, and good quality stuff. The selection is mainly from 50s to 60s, I guess it might be because of the copyright issue. But some of them are dated back much earlier. The earliest piece I came across dated back to the beginning of 20th century, it is a chant of Koran! As for the sound quality, you will be assured. First, the original recordings come from the French national archive, thus well preserved materials are used. Second, the recordings are carefully digitized in mono. If you use a headphone to listen to the music, you can almost get that same warm sound like listening to LP. One album on average costs around 6 USD on itune store, it’s a bargain for such good quality music and transfer. Each album comes with a BNF booklet (a pdf file). It briefly introduces the collection and BNF in French and English, unfortunately no further information about the recordings are provided. 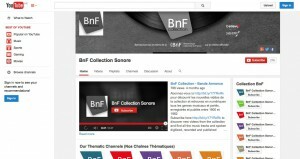 BNF Collection has youtube channels, you can go and sample some of its gems. It also has a twitter account, those having a twitter account can subscribe and follow their latest release. Now we come to the tango part. You can find many French Tango recordings in the collection. Personally I’m not fond of them, but the amount of French Tango and European Tango might surprise you. As for Argentine tango, there aren’t many (yet? ), but some surprising stuff. My biggest find is Pugliese. On Nicholas Lefcovich’s Pugliese discography, there are 8 controversial recordings – La Yumba, N.N., La Tupungatina, La Cachila, Pasional, Mala Junta, Barro and La Noche Que Me Esperes. These 8 pieces, according to the discorgraphy, might had been recorded again in 1952. If you haven’t heard about this story, please go and read Johan’s article “Osvaldo Pugliese & Nicolas Lefcovich, 8 controversial recordings“. Johan already did a full research on different CD versions and made a very detailed comparison. Now it seems these 8 recordings are available under one BNF Pugliese album. I listened to them myself and I believe they are indeed those controversial 1952 versions. In my opinion, even if you don’t bother to know the story, just go and get that clearer, more energetic version of Mala Junta! Another nice find is Angel Vargas’s 1956 milonga “Zapatitos de raso“. It’s not easy to get it on CD, and on youtube the version sounds just ok. But on BNF, you can get the best transfer ever, as if you’re listening to a brand new disc. There are also some 1950s & 60s recordings of Canaro, Fresedo, few more recordings of Pugliese plus few other orchestras. They are spread among the BNF “World” and “Variete Internationale” collections. To look for them, you need to search by orchestra. If you use itunes to search for BNF collection, you have to type “mono version” to look for them. Searching with keywords like “BNF” or “BNF collection”, you won’t find anything. This entry was posted	on Sunday, July 20th, 2014 at 10:54 pm	and is filed under Music. You can follow any responses to this entry through the RSS 2.0 feed. You can leave a response, or trackback from your own site. Hi Royce, isn’t that interesting about the Pugliese album – thanks for bringing it to our notice. I see that BNF have the publication date as 1st January 1954. An LP released in France at that time?